Caveat: I’m not a doctor and this isn’t medical advice (insert customary legal disclaimer here). If the commonsense writing ergonomics adjustments described in this article don’t work for you, see a physician. Repetitive stress injuries can end your writing career, and some injuries do require surgical fixes. Muscles are elastic. Relax them; they’ll show you where they like to rest when you take tension off them—which is our goal; tension causes pain. When some poor kid is given a wedgie, his elastic underwear waistband gets permanently distorted. When we overload our muscles and tendons—either by putting too much weight on them or by not allowing them to relax—they stretch out and become inflamed for the same reason. Compression loading requires no tension to maintain. You can stack dishes to the ceiling because the weight is directed downward to the kitchen counter. Side loads require tension to offset. If you stick a spatula into your stack of dishes and hang a pot on it, you’ll have to pull down on the opposite side of the top dish to keep the stack from flying apart. 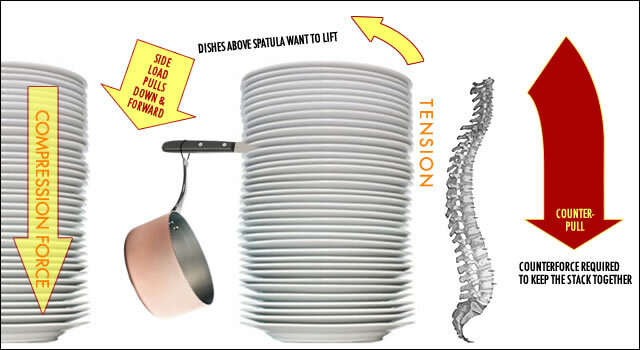 The vertebrae in your back work much like that stack of dishes. Lifting requires leverage. Imagine a 14-inch piece of wood sticking forward from the front of your shoe. Tie a piece of rope to the outer edge and you can easily pivot the wood up toward your knee. Tie the rope halfway along the wood and the lifting becomes harder. Now tie the rope an inch forward of your shoe. Lifting is difficult—and you have just built a model of your elbow; the tendons that lift your forearm (and whatever you have in your hand) pull with amazing strength from the base of the arm. Spines are structures comprised of stacks of vertebrae with rings of “padding” between them. Muscles connecting the vertebrae allow us to bend and flex our backs—forward, backward, and from side-to-side. Because of the natural curves of the spine—inward at the lower back and outward at the upper back, our spines will never align perfectly like a stack of dishes. But if we lean forward, the weight of our head and upper body tries to slump us over in the same way. Muscles along the back of the spine contract to counteract this weight, resulting in tension, pain, and potential injury if the counterforce is sustained for long periods of time—which is why a good office chair has a contoured back that supports the curves of your spine. 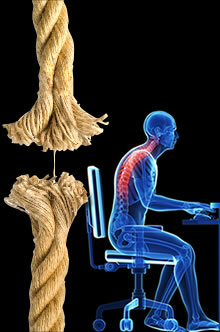 What causes ergonomic back injuries? Aside from general, habitual bad posture, if the monitor is too far from your eyes to allow comfortable focusing, or at too low a position, you naturally lean forward. If your monitor is farther away than arm’s length, bring it closer to help bring the backbones into comfortable vertical alignment against the supporting back of your chair. Years in front of a monitor (and general aging) can compromise your ability to focus on close objects. Cheap over-the-counter reading glasses make it possible for me to keep my monitor at the correct distance set to its highest resolution. Don’t let easily correctable vision problems turn into painful back problems. The head and neck have an important relationship. Touch your chin to your chest and then slowly rotate your head backward until you face the ceiling. At some middle point, about where you’re facing straight ahead, your head balances atop your neck. If your monitor is too low or is improperly angled, you’ll compensate by leaning your head forward—resulting in stress on the tendons and muscles of the back of the neck. Most injuries come from adjusting your body to your workspace instead of the other way around. Sit straight up at your desk with shoulders relaxed and your hands in your lap, looking straight ahead. 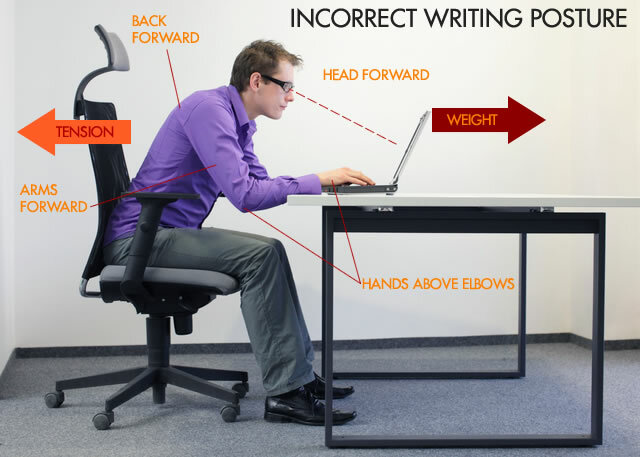 Adjust the height, angle, and distance of your monitor and/or your chair to complement this “neutral” posture. Make adjustments. Listen to your body. Remove as much tension as possible. 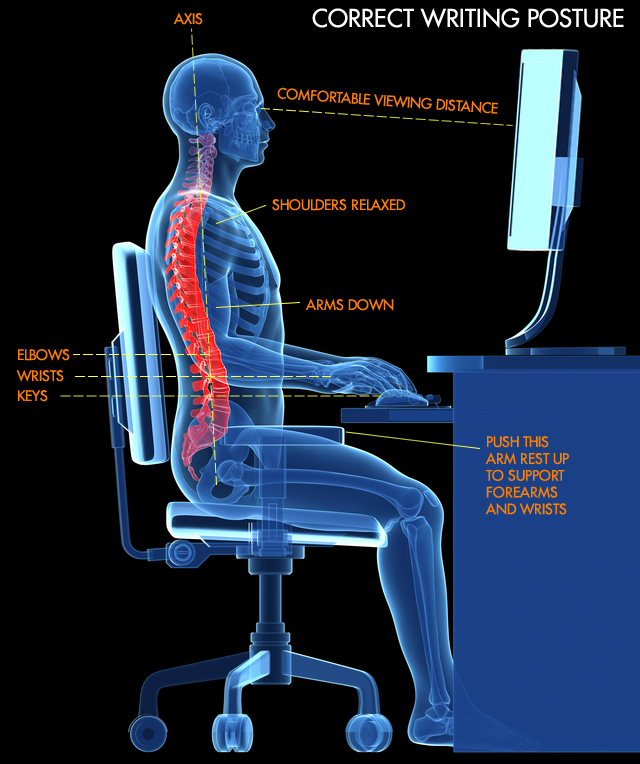 The proximity of your eyes to your screen can actually encourage good posture if you set your workspace up correctly. With the body and head properly positioned, consider the positions of the arms and hands. Let your arms hang straight down from the shoulders. If you chair has arm rests, adjust their heights to gently support the elbows. Position your keyboard in a keyboard tray slightly below the elbows. Remember the piece of wood we attempted to lift with the string? If your elbows have to lift your hands off the keyboard or keep your hands hovering while you type each phrase or sentence, the amount of cumulative weight kept suspended over time is staggering. Symptoms of tendonitis, like “tennis elbow,” can often be alleviated simply by lowering your keyboard a few inches. Fingers and hands should arc gracefully down from the wrists to rest almost weightlessly on the keyboard. If needed, use a wrist wrest containing soft gel or beads to support the hands at the correct height over the keyboard. A traditional, flat computer mouse is likewise an ergonomic liability. 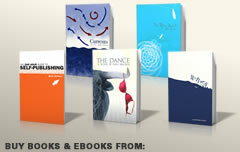 How many times will you click, press, and drag during your writing career? The Kinesis Freestyle II split keyboard comes in Mac and PC versions. The two halves of the keyboard can be adjusted independently to accommodate the angle of the arms inward from the elbow. The VIP base allows you to angle the inside halves of the keyboard upward to follow the natural upward angle of the hands at rest. The “vertical mouse” is offered by various manufacturers at various price points. The $19 SHARKK wireless ergonomic mouse has the buttons on the side. I’d like to see a hair less resistance on the button, but I found this mouse easy to adapt to and fine for precision graphic work. Add up the costs of a good office chair, a monitor stand, a keyboard tray, an ergonomic keyboard, and a vertical mouse, and you’ll probably find that the costs associated with being a writer are more than expected. But the same is true for almost any physical endeavor: proper life jackets, a helmet, a good tennis racquet, a carbon fiber paddle, a set of knee and elbow pads. Whatever your sport happens to be, good gear is always cheaper than getting injured—and it’s a lot more comfortable. 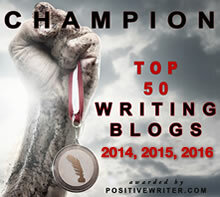 If you’re serious about writing and plan to spend months or years at the keyboard, every step you take to reduce repetitive stress injuries is a worthwhile investment in prolonging your writing career. Dave (or anyone), please leave a comment if you ever find a tented keyboard with short throw. Many thanks for all the goodi info in this article, and subsequent comments. I have the same problem. My tented keyboard is wonderful, but I wish it had short-throw Apple keys on it. I’m using a stand up desk in my day job – feels so much better. One trick I learned years ago after suffering a lot of pain and discomfort from tense, hunched writing is to sit back and drop my hands to my sides while thinking and reading. We are rarely typing flat out and we don’t need to keep our hands in the danger zone pulling ourselves forward all the time. If you can train yourself to do this you’ll be using your abs more when sitting and hanging off your sine hunching far less. It is also a great way to relax. Get a wireless keyboard so you can position the screen for your eyes and the keys for your arms/hands. Try a leg rest that offers custom support. Maybe a flexible keyboard like http://goo.gl/y7FsCP can be coaxed into an ergonomic shape if bent over the spine of an open book? I assume you work in some sort of reclining chair. Have a desk built that rolls over you and your chair—or perhaps modify one of those swing over “dining tables” that hospitals use. This article does offer one important principle for people who don’t work at desks or who have other non-standard circumstances: relax your body, listen to your muscles, and build your workspace to reduce tension. If that means lying on your back with a screen and keyboard suspended from the ceiling, so be it. Think beyond the average solutions; they’re created by average thinkers for average people. Great article. My back doc tells me the same time every time I visit him. Computers have given him retirement security. How is the key feel on that Kinesis? And the sound? I’m mad for Apple keyboards’ touch and quiet, but I also like my tendons and ligaments where they are now. It’s an “old style” keyboard with the long throw. I prefer Apple’s light touch keyboard, too, but my elbows and forearms said “no” to the flat keyboard. I’d love to see a tented keyboard with short throw keys, but my pain has gone away with this one. Please forgive my ignorance: what is “throw,” or what are “throw keys”? The “throw” is the distance you have to push the key into the keyboard to get it to type a character. Apple keyboards (at least their new ones) have a very short throw; it’s quite nice, and also makes for a thinner keyboard. And quieter. 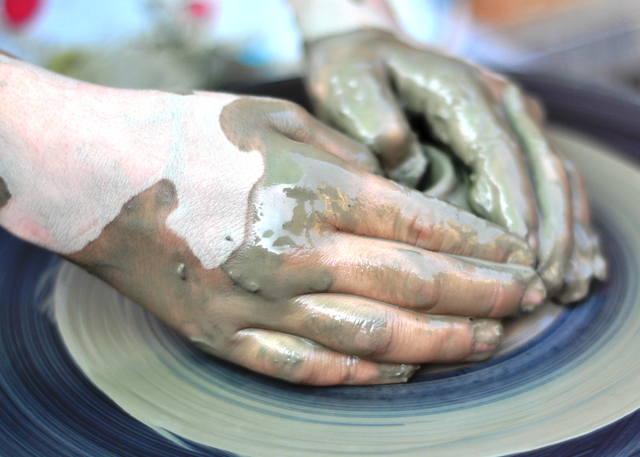 Short throw = far less noise, both from the mechanism and from the fingers. The sensory feedback prompts gentler typing.